Hi friends. It's hump day, thank goodness! I was off work on Monday to deal with the loss of our sweet Abby so Tuesday was one heck of a work day. Why am I not retired yet?? I decided I needed some more simple, any occassion card so this is what I came up with. First off since I'm still really into easy cards, I used the Dip-Dyed Cardbases from Concord & 9th. I was able to use scraps for everything else. 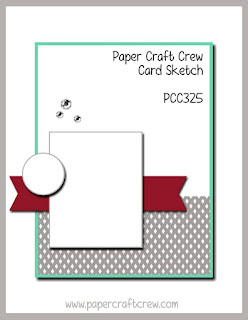 The DSP used is from the Needlepoint Nook pack. The flower is from the coordinationg Needle & Thread Bundle. I simply punched out the leaf from a scrap of Tranquil Tide cardstock with the leaf punch. The banner was cut from a scrap of Poppy Parade. Finally, the sentiment, is from a retired stamp set called "Party Pants". I liked the sentiment as well as the size. I don't know if you get rid of retired sets but I don't if I like them and Party Pants is one of those cool sets. 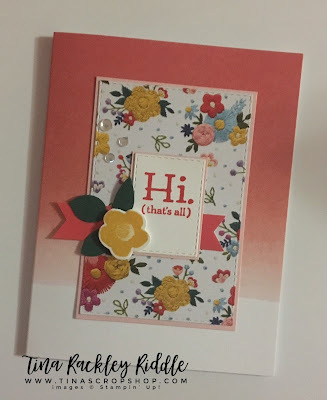 Totally simple card but so pretty. I love how it turned out. I love that sentiment too! Thanks Petra!